The Antenna Controller System contains an equipment suite of the latest satellite communications tools to perform remote tracking, signal testing and signal monitoring functions. 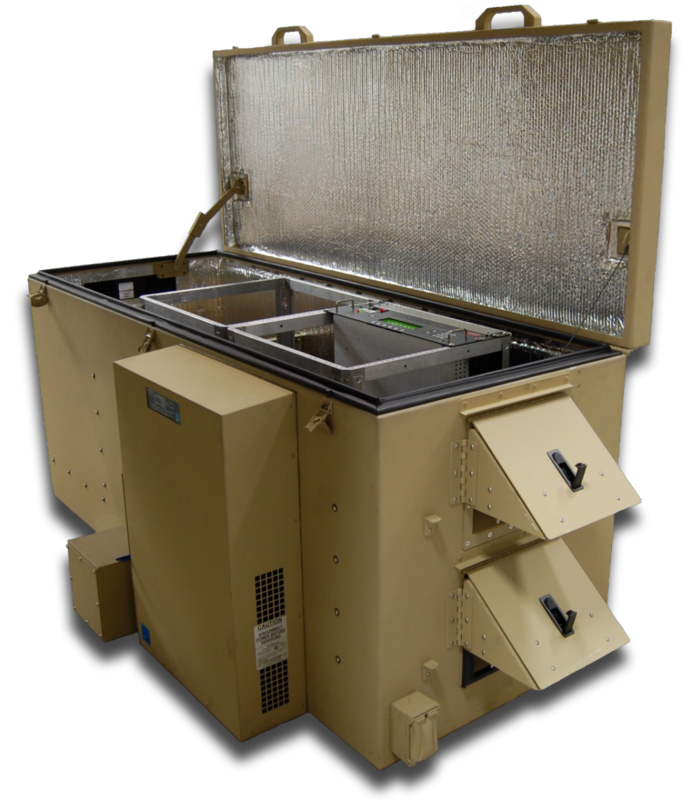 All equipment is contained within a rugged 70” x 33” x 27” container, fitted with a small ECUs for use in extreme and isolated environments. The system has been designed to simplify setup and configuration. All equipment connections (RF, data and power) are made along the back of the container. 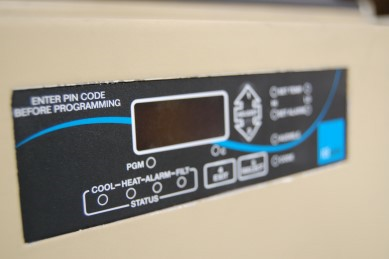 The system can be controlled internally with a connected PC containing the custom control software. The Antenna Controller System offers two methods for space vehicle tracking. The system can move with the satellite by periodically measuring signal strength or it can move the antenna based on previously saved data (without taking measurements). The Antenna Controller System is also equipped to control motorized antennas for automatic and remote positioning. Monitored events can be recorded through the custom software for post-process analysis and playback. The system contains a satellite bypass feature that performs L, C, X, Ku and Ka uplink/downlink frequency translation internally. Terminal output from the Antenna Controller System can then be fed to downlink monitoring equipment. This design can be utilized for loop-back testing or any other application that requires minimal amplitude and delay time. 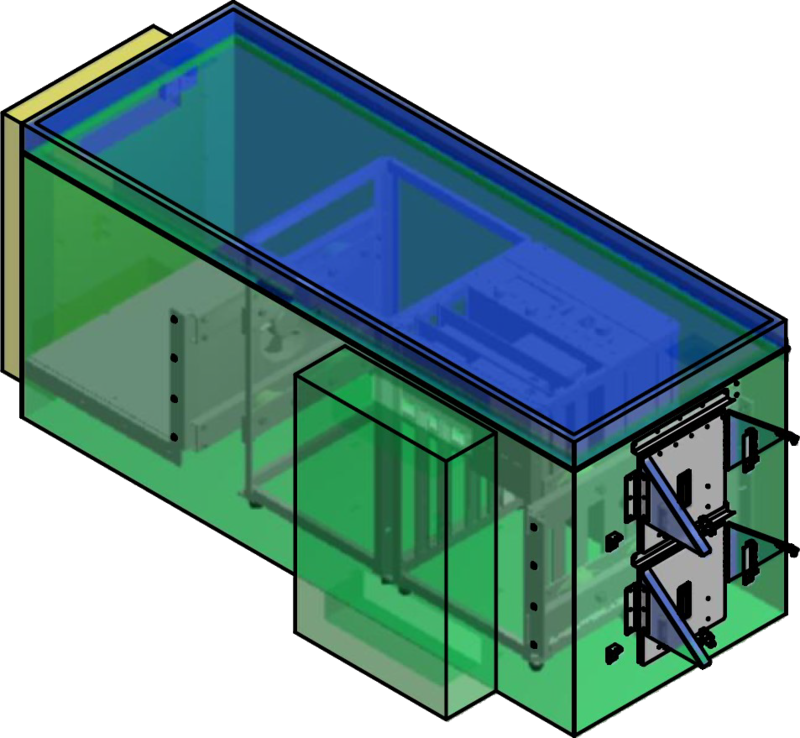 A 19” x 15” storage area is available inside the enclosure for placement of spare, non-critical and peripheral equipment. The storage is also an ideal location for communication and power cables during system storage or transport. 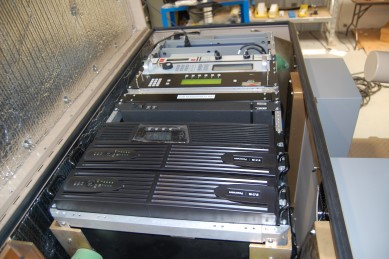 The Antenna Controller System houses up to 20U of 19” rack equipment. Equipment can be reconfigured to fit customer requirements. Pass-through panels have been redesigned to allow the system to remain connected and operational in wet, icy and windy conditions. 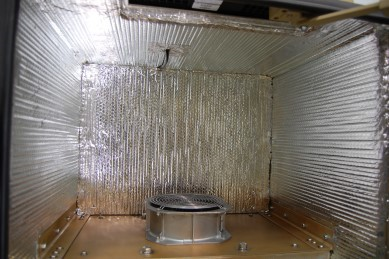 The system is equipped with three 5000 BTU air conditioning units, sealed and lined with insulation. With a cooling capability built into the unit, the system can operate for extended periods and remain sealed from outdoor elements. The entire chassis is 100% sealed to protect from foreign debris. 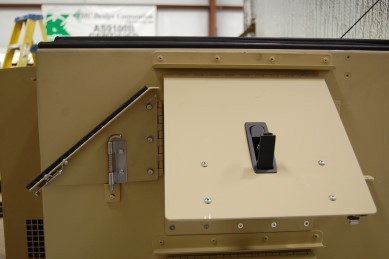 External chassis components are powder coated and CARC painted to provide maximum protection from outdoor elements.